A standing wave is produced by the superposition of waves moving to the left and right, reflecting back and forth between two fixed points. Interference effects produce both nodes, where the two waves cancel by destructive interference, and antinodes, where the waves reinforce by constructive interference. The possible wavelengths for standing waves on a string, rope, or wire of length , attached at both ends, require that be an integer multiple of the half-wavelength. Click the "time" play/pause button to start or stop the animation; adjust the number of half-wavelengths on the string with the "harmonic n" slider; select the options to display: standing wave, wave moving right, wave moving left, wave envelope (maximum displacement of standing wave), shading, or velocity arrows for different parts of the string. In transverse waves, the actual motion is perpendicular to the direction of wave propagation. This Demonstration allows experimentation with standing waves on a string , a commonly observed type of transverse wave motion . Other types of transverse waves propagate through solids , the motion of the particles of the vibrating medium being perpendicular to the direction of wave motion. This is represented by the up/down arrow option, which indicates the direction and (scaled) magnitudes of the velocity vectors in a series of string segments. The default options display the standing wave itself and its "envelope"—the maximum displacement up or down for each point on the string, clearly indicating the locations of nodes and antinodes. 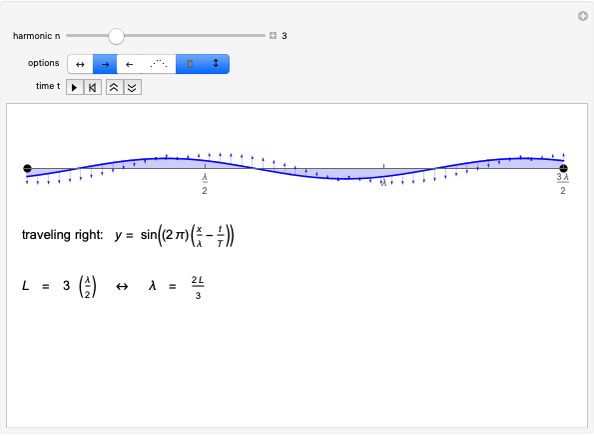 The default option for shading between the wave and the axis highlights the displacement of the string from its equilibrium position. Other options allow the separate display of the right and left component waves and velocity vectors. 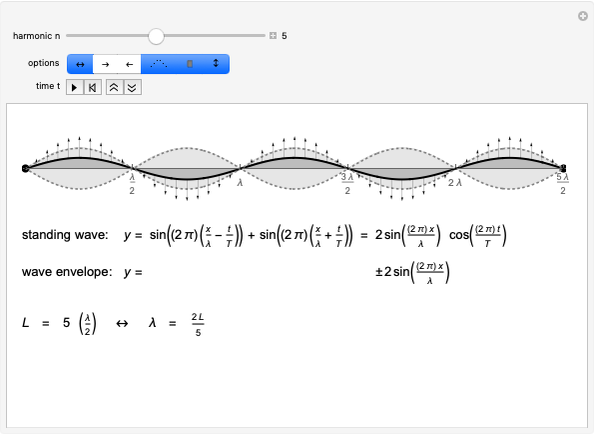 Equations for any displayed waves are shown . Try different combinations of the options (but probably not all at once), to view each situation with time running and with time paused at different moments. Adjust the time controls to slow down the animation. See how the component waves are reflections of each other at both ends of the string, each bouncing or being reflected back to form the other component wave, and adding in such a way that the endpoints remain stationary. For more information, see any college physics textbook, or see "Standing Wave" on Wikipedia. It should be noted that the purely transverse wave in a string assumes small wave amplitude, which is generally a good approximation. When vibrating in its first harmonic, a plucked guitar string ( ) typically has a maximum amplitude of one or two millimeters at its center (perhaps 3% of the string length) and correspondingly less for higher harmonics with multiple half-wavelengths filling the string length. In this Demonstration the maximum amplitude, exaggerated for easier viewing, is set at of the string length with no decrease in amplitude for higher harmonics, yielding images that are relatively accurate for , but increasingly distorted for higher values. The exception being electromagnetic waves, which can traverse a vacuum but are transverse, with both electric and magnetic fields oscillating perpendicular to the direction of wave motion (and to each other). There exist many other forms of these equations. The equations shown express the transverse displacement in terms of wavelength and wave period ; variants can be derived by writing the period in terms of frequency ( ) or angular frequency ( ), and/or writing the wavelength in terms of the wave number ( ), or introducing the wave speed , where . 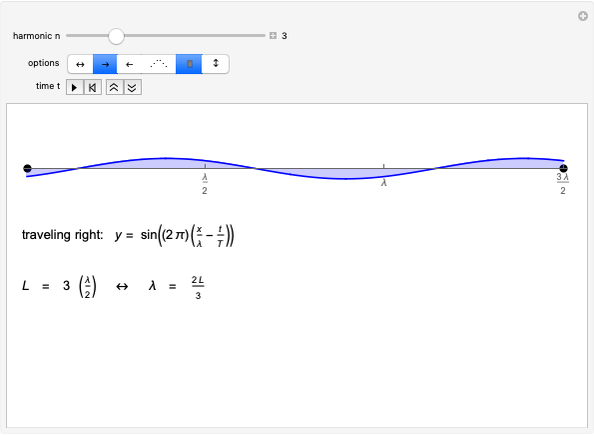 In general, the cosine function can be used instead of the sine function, or sines and cosines with arbitrary phase factors and amplitudes, for example: . But the restriction that each end of the string be a node defines the phase factors and the result reduces to , which in turn reduces to the forms shown, with , and the additional restriction that or for some positive integer . Ken Caviness "Transverse Standing Waves"